West Central Indiana will soon have a new tool to promote the region's exceptional hand-crafted art and food and boost the economy in a six-county region. A new trail that shines the spotlight on area residents known for high quality work will result from a collaboration between Indiana Artisan and Indiana State University's Rural-Urban Entrepreneurship Development Institute (RUEDI). "The goal of the Rivers and Roads Artisan Trail is to make strong connections between local art and organizations, to drive economic development and promote artisans in the West Central Indiana region," said Steven Pontius, RUEDI director. The trail will include the area along U.S. highways 40 and 41 and by-ways within Clay, Parke, Putnam, Sullivan, Vermillion, and Vigo counties. Indiana Artisan provided funding for, and partners with, seven existing Artisan Trails winding through 27 Indiana counties, and Rivers and Roads is the eighth to join the consortium. "The focus Rivers and Roads will bring to the art and foods produced in the region will help identify those of the highest quality," said Indiana Artisan Director Eric Freeman, "and we look forward to their work becoming part of the Indiana Artisan brand." Of the 249 Indiana Artisans whose work has been identified as among the highest-quality in the state, six live and work within the trail's six-county area: Mark Donham, Rosedale; Gretchen Kraut and Marilyn Oehler, Terre Haute; Ken Palmer, Perrysville; and Brooke Schmidt and Donna Thompson, Dana. "These six Artisans - woodworkers, fiber artists, chocolatiers, and a jewelry maker - will benefit from the development of Rivers and Roads," Freeman said. "And, in return, all of the art and food establishments along the Trail will benefit from Indiana Artisan's support and promotion of it. The goal of all the Artisan Trails is to help drive a market to the studios, galleries and workshops of the artisans so visitors can meet them, see their work being made and hear their stories. That adds significant meaning to the art and the foods, and it supports Indiana's small town and rural economies." Indiana's heritage in glass, musical instruments, stoneware, woodwork, candies, brandies and more is defined through Indiana Artisan. The Indiana General Assembly passed a resolution in 2011 making it the state's official organization to review, recognize and promote the work of Indiana's highest-quality art and food artisans. One of its promotion efforts is Artisan Trails, which increase the impact tourism has on a diversified economy while positively affecting individual artisans and overall quality of life, Freeman said. Trails also support entrepreneurship by providing artisans with access to an expanded market, he added. "From the Parke County Covered Bridge Festival to the Halcyon Contemporary Art Gallery to exhibits of work by university students, West Central Indiana demonstrates strong support for the local arts community," Pontius said. RUEDI, Clabber Girl, Arts Illiana and Art Spaces, along with art and food artists, formed an Advisory Board now working to identify interest in the Trail in each county. Artisans must apply and be approved, a process ensuring that all venues provide the public with a meaningful experience. Rivers and Roads will feature an interactive website, illustrating the region with a functional map allowing visitors to individualize their trip and print the map from their computer. The trail also will create a brochure to be distributed at restaurants, hotels, visitor centers, and retail establishments in the region. It will include a trail map, as well as brief descriptions of participating artisans. In addition, the Indiana State University Office of Communication and Marketing will assist in promoting Rivers and Roads and the events and artisans along it. More about Indiana Artisan can be found at www.IndianaArtisan.org. 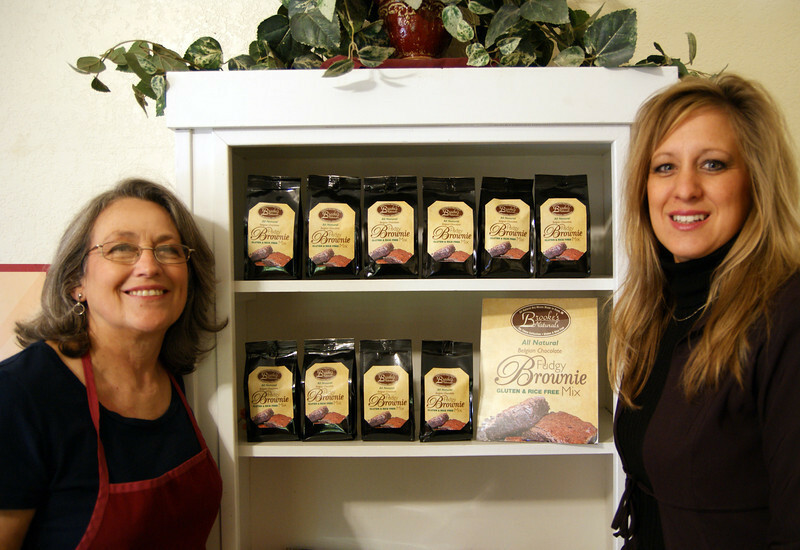 Photo: http://isuphoto.smugmug.com/photos/i-7Qd5p4k/0/L/i-7Qd5p4k-L.jpg - Brooke Schmidt (right) and her mother, Donna Thompson, of Brooke's Candy Co. in Dana are among Wabash Valley artisans included in the Rivers and Roads Artisan Trail, the result of a collaboration between Indiana Artisan and Indiana State University's Rural and Urban Entrepreneurship Development Institute. ISU's Rural Urban Entrepreneurship Development Institute has partnered with Indiana Artison to promote West-Central Indiana's exceptional handcrafted art and food and boost the region's economy.